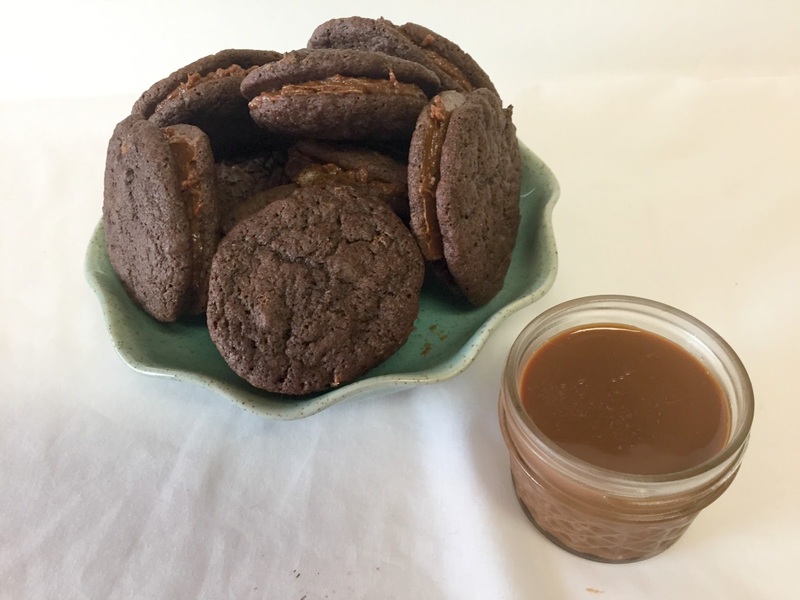 This #Choctoberfest event wouldn’t be complete unless I combined chocolate and caramel together in at least one recipe. 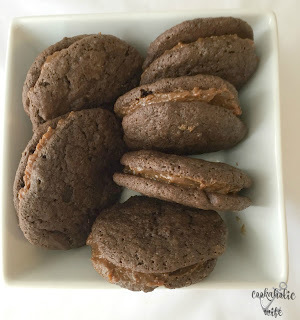 While I love each individually, there is just something magical that happens when they pair together, especially when you use dulce de leche instead of a standard caramel. If you missed the recipe yesterday, here is how you make your own dulce de leche caramel sauce, which is so easy and way better than shelling out the sometimes $6 per jar they charge in the stores! Chocolate cookies are turned into sandwiches with the addition of dulce de leche. 1. Preheat oven to 325 and line a large baking sheet with parchment paper. 2. In the bowl of a stand mixer, combine butter and sugar and beat on medium speed until light and fluffy. Add in eggs one at a time until combined, then add in vanilla. 3. Meanwhile, combine flour, unsweetened cocoa powder, baking soda, cinnamon and salt together in a medium bowl. 4. Turn the mixer speed to low and slowly add the flour, mixing until just combined. 5. Scoop out dough and roll into a 1 ½ inch ball. Sprinkle with sugar and place on the baking sheet. Repeat with remaining dough, placing each cookie 2 inches apart until all cookies are on the baking sheet. 6. Bake for 12-15 minutes or until cracked and still soft. Remove from the oven and allow to cool on wire racks. 7. Once cooled, spread dulce de leche on the bottom of one cookie and place another cookie on top, creating a cookie sandwich. Good luck not eating these all at once! Don’t forget that there is the giveaway to enter! You’re running out of time! 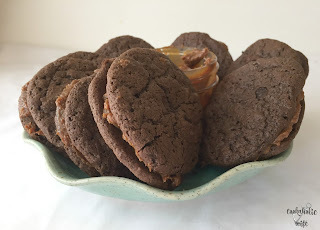 mmmmmmmmm — I was thinking of doing something with dulce de leche, but I ran out of time… Sandwiching it between chocolate-y cookies sounds like a win-win idea!